Samsung DeX Guide and Tutorials - Samsung DeX is a service that allows you to use your smartphone like a computer by connecting the smartphone to external display, such as a TV or monitor. Download Samsung Dex manual and learn how to connect with your Galaxy S8 or other device, setup / settings so you can enjoy to watch your phone in TV or large display. This time of course we want to be able to use the hp easily. Sometimes we also want to display the moment video images which we have record on friends, family or relatives even presentations in the Office. 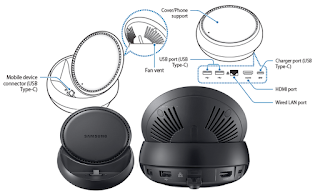 The following are the Samsung DeX manual that allows you to use your smartphone like a computer. With the capabilities and technology on Samsung Galaxy S8 / Galaxy S8+, you can use your Galaxy S8 like computer on a large screen conveniently by connecting an external display, complete with keyboard and mouse. Be sure to use a USB Type-C cable. If you connect a Micro USB cable, the multimedia dock may malfunction. Connect the Samsung Dex charger to the multimedia Dex dock’s charger port (USB Type-C). Plug your Samsung Dex charger into cource of electric current. If you want fast charging, use only Samsung-approved chargers that support fast charging (12 V/2.1 A). Depending on the type of charger you are using, you may need to use the Micro USB connector. To save energy, unplug the charger when not in use. The charger does not have a power switch, so you must unplug the charger from the electric socket when not in use to avoid wasting power. The Samsung Dex charger should remain close to the electric socket and easily accessible while charging. Be careful not to hurt your fingers when changing the angle of the smartphone support. You can use the multimedia dock only when you connect it to a charger. Connect only a keyboard, mouse, or an USB storage device to the multimedia dock’s USB ports. Charging devices or connecting high-capacity devices with these ports may not work properly. Prevent the fan vent and mobile device connector inside from coming into contact with liquids or dust. Exposure to liquid or dust may cause the multimedia dock not to work properly. Do not move the mobile device while it is connected to the multimedia dock. Doing so may damage the mobile device connector. When you use the mobile device’s voice recognition after connecting the multimedia dock to your mobile device, the voice recognition may not perform well. Connect the charger to the DeX Station’s charger port (USB Type-C). end of the cable into a TV or monitor’s HDMI port. To use a wired network, connect the wired LAN to the wired LAN port. Press on the front of the cover to use the cover as a smartphone support. You can now see the smartphone connector. Samsung DeX will launch on the smartphone. You may not use the DeX Station if you have attached a certain type of case, such as a flip cover or a hard case cover to your smartphone. from Samsung DeX mode or screen mirroring mode. 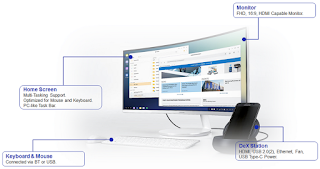 START SAMSUNG DeX: Your smartphone’s screen will turn off and appear on the connected TV or monitor in desktop mode. SWITCH TO SCREEN MIRRORING: The same screen as your smartphone will appear on the connected TV or monitor. How to Connect Keyboard and Mouse on Samsung Dex? You can connect a keyboard and mouse to the DeX Station’s USB ports in the Samsung DeX mode. When you connect a keyboard, the virtual keyboard will not appear when you select the text input field. You can also use a wireless keyboard/mouse or Bluetooth keyboard/mouse. Connect a mouse to use Samsung Dex mode. Connect a wired mouse and keyboard to the multimedia dock’s USB port or connect a wireless mouse and keyboard with the Bluetooth feature of the connected mobile device. If you connect a keyboard, the virtual keyboard is not displayed on the screen. On the Settings app, select Samsung DeX → Show virtual keyboard in Samsung DeX switch to activate it to display the virtual keyboard on the screen. You can connect a wireless mouse and keyboard or Bluetooth mouse and keyboard. For more information about the devices, refer to the device’s user manual. Wireless mouse and keyboard: Insert a wireless receiver into the USB port. Bluetooth mouse and keyboard: Connect to a mobile device via Bluetooth. After you connect your device into Dex, your smartphone’s screen will turn off and a virtual smartphone screen will appear on the connected TV or monitor. You can multitask by running multiple apps simultaneously. You can also check your smartphone’s notifications and status. On the mode selection screen, tap START SAMSUNG DeX. You control the Samsung DeX screen by use a mouse and keyboard, and when starting or ending Samsung DeX, running apps may be closed so the next you must see the monitor. 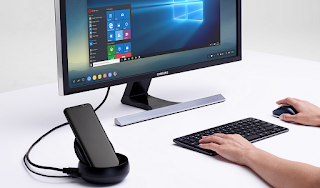 Some apps or features may not be available when using Samsung DeX. Favourite apps: Add frequently used apps to the Home screen and launch them quickly. Apps button: View and run your smartphone’s apps. Taskbar: View the apps that are currently running. Status bar: View your smartphone’s notifications and status. Status icons may appear differently depending on your smartphone’s status. When you click , the quick setting buttons will appear. You can activate or deactivate certain smartphone features using the quick setting buttons. Quick access toolbar: Use quick tools, such as volume control or search. or monitor. Select the call answering option on the connected TV or monitor to answer a call. Your smartphone’s speaker will be used during the calls. If you do not want to use the speakerphone, remove your smartphone from the DeX Station. It may take a few seconds to display the call screen on the smartphone. The screen mode you first select will be applied for subsequent connections. Connections → More connection settings → HDMI mode → Samsung DeX or Screen Mirroring. Remove your smartphone from the DeX Station multimedia dock to end the connection /disconnect between the mobile device and TV or monitor.